Missouri Earthquake Insurance | Are You At Risk? According to an article published by the Missouri Department of Insurance, Financial Institutions & Professional Registration, many Missourians are having trouble getting Missouri Earthquake Insurance Coverage. Recent insurance data demonstrates that southeast Missouri is experiencing an insurance coverage crisis. Click here to read the full article on Department of Insurance Website. Contact Alternatives Insurance of Chesterfield today for a free insurance review and we’ll help you determine if you qualify for Missouri Earthquake Insurance. Check Out the earthquake preparedness videos created by Missouri school children! Alternatives Insurance of Chesterfield is a full service Independent Insurance Agency representing many of Missouri’s premier personal and commercial insurance carriers. We assess risks and shop for companies to find the best coverage for the lowest price. With a combined experience of over 60 years in the Chesterfield Missouri insurance industry, our agents are knowledgeable and competent specializing in auto, home, renters, boat, motorcycle, business automobile, workers compensation, and general liability. We serve all of Saint Louis and Jefferson counties including Chesterfield, High Ridge, Arnold, Imperial, Valley Park, Ballwin, Eureka, Pacific, House Springs, Hillsboro, Sunset Hills and St. Clair. Our professional insurance agents at Alternatives Insurance of Chesterfield can help you get the best value for your Missouri insurance needs. Alternatives Insurance® of Chesterfield knows it is important to help home owners understand their options and how to best protect their family and belongings in case of a loss. Our agents are here to help home owners know where to learn more about home insurance in Chesterfield MO. There are many coverage options you can have in your policy. On your declaration page you will see several terms; including dwelling coverage and personal property coverage. The word dwelling in your home insurance policy actually refers to your home itself and attached structures, such as an attached garage. One of our experienced agents can run a cost analysis that calculates the cost to rebuild your home. If you don’t adjust the amount of insurance for your dwelling appropriately, you may not have enough insurance to replace your home if disaster strikes. Your personal property includes all your personal items, such as furniture, clothing, electronics, appliances, etc. Your personal property limit is usually 70% – 75% of your dwelling limit. However, you can adjust this upward if you need more protection, discuss your options with us. We’re here to help! Detailed information about home owner insurance and how to contact us can be found on our website. If you have been searching for a ” Chesterfield MO Insurance agent ” look no further! Alternatives Insurance® of Chesterfield Missouri is a full service Independent Insurance Agency representing many of Missouri’s premier personal and commercial lines insurance carriers. We pride ourselves knowing we employ some of the best insurance agents in Chesterfield Missouri. Our licensed professionals act as intermediaries between insurance companies and you, the insurance buyer. We advise our clients on the insurance policies that best suit their needs. Many of our agents specialize in a variety of insurance products, such as business, life and auto, and we are well-versed in several forms of insurance coverage. As your insurance advisor, our primary concern is you, the client, and your well being. We don’t just sell products. We actively shop a variety of companies to find the best coverage, at the rate that meets your budget. We take the time to explain the various types of coverage and help inform you of your options along the way. Searching for a “Chesterfield Missouri Insurance Agency”? Often times our agents meet potential customers who have had an insurance agent for years and whom they have never met, nonetheless have visited their office. It is shocking to me that people put their life in the hands of a stranger and have no personal connection or relationship with their Chesterfield Missouri Insurance Agent. The Chesterfield Missouri Insurance Agency of Alternatives Insurance® prides ourselves on the fact that we take great interest in our clients’ and their family’s well-being. It is important that our clients trust the staff and licensed agents of our agency. Alternatives Insurance® Chesterfield Missouri Insurance Agency staff meets one-on-one with our clients to provide a comprehensive account review and make sure they have the best protection. We explain the coverage options, benefits, and potential risks based off their needs versus current their current insurance coverages. We take the time to walk our client’s through every step of the decision process to make their experience as educational and informative as possible. Alternatives Insurance® of Chesterfield opened in 2007 as a full service Independent Chesterfield Missouri Insurance Agency and a proud member of Alternatives Insurance® Group. Alternatives Insurance® Group is an organization of insurance agencies located in the local St. Louis area; founded in 1992. The agents of Alternatives Insurance® of Chesterfield are licensed producers with Missourire than 60 years combined experience. The agency is dedicated to providing every client with protection products that are tailored to fit their individual needs. Whether it’s personal or business insurance, we provide the tools, resources, and superior customer service. Year after year, our team continues to review, improve, and renew our products in addition to maintaining relationships with our valued carrier partners. Our exceptional efforts and commitment ensure our clients’ fundamental insurance needs are met completely, competitively, proudly, and locally, by the staff at Alternatives Insurance® of Chesterfield. You can find dozens, if not hundreds, of local Chesterfield Missouri Insurance Agency in your telephone book or on the internet. Thanks to the internet you can also go directly to many insurance companies and get a quote. If you like the quote you can often buy a policy by filling out a few Missourire forms, right on the spot. This is where the customer relationship has a disconnect. While we also offer quick quote button on the right of this page, we take the time to contact you personally. We schedule an appointment to meet in person, get to know you and listen. So why not do business with a local Chesterfield Missouri Insurance Agency, who can very likely get you a better deal than you can get for yourself. Alternatives Insurance® of Chesterfield serves all of Saint Louis County Missouri, including Chesterfield, Ballwin, Manchester, Creve Coeur, Glencoe, Wildwood, Town and Country, Frontenac, Ellisville and Des Peres. We proudly represent many of the industry’s leading national and regional Missouri insurance companies offering competitive rates through Travelers, Safeco, EMC, Kemper Preferred, Progressive, The Hartford, West Bend, Chubb and dozens Missourire. Alternatives Insurance® of Chesterfield is a supporting member of the Missouri Association of Insurance Agents and committed to the TrustedChoice® Pledge. The agents of Alternatives Insurance® of Chesterfield are fully licensed and comply with the Missouri Bureau of Insurance requirements. Once our Chesterfield Missouri Insurance Agent receives a license we ensure they comply with continuing education requirements and complete courses approved by the Missouri Insurance Department. All of our agents throughout the company are compliant and ready to work for you. Alternatives Insurance® of Chesterfield agents are advisors you can trust. Personal service – Agents are trained to assess your needs, offer unbiased advice and support you should the unexpected happen. Peace of mind – Your auto insurance agent is a member of your local community and can handle your full range of insurance needs all in one place. Value – Your independent agent can access insurance coverage from multiple carriers – such as Travelers, Safeco, EMC, Kemper Preferred, Progressive, The Hartford, West Bend and Chubb – to provide you with the best mix of savings and pricing. Alternatives Insurance® of Chesterfield is committed to outstanding customer service. We start by offering the best insurance products at a reasonable price. But it’s the Alternatives Insurance® of Chesterfield team that really set us apart from the competition. With combined experience of 60 years, our sales and support staff members can handle your transactions quickly and efficiently. We service each and every account using out team of insurance professionals and we’re always available to answer your questions. Our team is committed to professionalism. Our dedication to superior client service comes from a culture of professionalism and respect. All of our associates at Alternatives Insurance® of Chesterfield have strong credentials and all of our policies are presented to you in a consistent and professional manner. You can depend on us to solve problems quickly. Alternatives Insurance® of Chesterfield has unique industry relationships, allowing us to provide exclusive insurance solutions to our customers. Additionally, every staff member is trained to actively listen and provide helpful answers presented in a way in which our policy holders clearly understand. Our agents have a strong work ethic and are committed to earning and maintaining your trust. We believe trust is something earned by listening to our customers while providing helpful advice and support. Trust and consistent underwriting practices is what we expect from our carrier partners, and in return we owe the same level of service to you. Any questions? Contact one of our professionals and we’ll be happy to spend the time with you in person! Our service to you is number one priority. We thank you in advance for your trust, and rest assured we will earn it! Have you been searching for ”Chesterfield MO Home Insurance,“ and you’re not quite sure what home insurance coverages are necessary to protect you, and one of your most valuable assets? Many of us have been in a situation where we need insurance and depend on our mortgage company or shop online, to find the least expensive home insurance coverage. Have you considered if something happens to your home whether your insurance policy will actually cover the damage? Will it pay for ALL of it? As a homeowner, there are many risks our agents can help you avoid. For most people, insurance is confusing. Homeowners may not understand the liabilities that come with being a homeowner and the protection of having the right coverages in the insurance policy. Homeowners in Chesterfield Missouri should be aware that the majority of mortgage lenders require homeowners insurance. This article, Chesterfield MO Home Insurance, will explain the primary insurance coverages that are included in your homeowners policy what they mean, what is not covered and additional coverages available to you. The word Dwelling in your home policy actually refers to your home itself. It includes attached structures, such as an attached garage. The Amount of Insurance (Dwelling Limit) listing on your Declarations page indicates the maximum amount your insurance company will pay to replace your home if it’s destroyed by a covered claim. But,is it enough? Don’t make the mistake of thinking your homeowners insurance covers everything just because you have an insurance policy! Among other issues, you must make sure your Dwelling Limit is enough to rebuild your home. Contact Alternatives Insurance® of Chesterfield and one of our experienced agents can run a cost analysis that calculates the cost to rebuild your home. Be sure to adjust the amount of insurance for your dwelling appropriately. If you don’t you may not have enough insurance to replace your home if disaster strikes. Some policies include built-in protection above the stated Dwelling Limit – usually a percentage of the Dwelling – just in case the estimate is too low. We will make sure to discuss this with you as an additional protection feature. It’s probably worth having. The most common Other Structures are sheds, stand-alone garages (known as “detached” garages in insurance terms), barns, pool houses, etc. These structures are not directly attached to your home, that are referred to as the “dwelling”. Other Structures have their own protection limit – the most your company will pay to rebuild them will be stated on your Declarations page. This limit will be significantly less than the dwelling limit … typically 10% – 20% of the dwelling amount. For most people that’s plenty of insurance for other structures. But not for everyone. You need to know what it would cost to rebuild or replace those structures if they’re destroyed. Discuss it with the licensed professionals in our office. You can buy more protection for your other structures if you need it. Your personal property includes all your personal items, such as furniture, clothing, electronics, appliances, etc. Similar to other structures, personal property has its own protection limit stated on your Declarations page. And, again, this amount is the most the insurance company will pay to replace your personal property. You can also add a Ryder to your insurance policy that will cover jewelry; so long as you have the proper documentation like an appraisal from a qualified jeweler. Your personal property limit is usually 70% – 75% of your dwelling limit. However, you can adjust this upward if you need more protection, Discuss your options with us. We’re here to help! Regardless of the protection limit for your personal property, there’s a very important question you must get answered. How is your property protected? It is determined by the “actual cash value” or “replacement cost”? The difference is huge! In very basic terms, if your property is protected on a replacement cost basis the insurance company will replace your old stuff with new stuff. For example, if your 5-year old TV is destroyed in a covered claim, the company will pay for a brand new TV. That’s a good deal for you. But if your property is protected on actual cash value basis, an “allowance for depreciation” is applied to the cost of a new TV based on the age of your destroyed TV. The result is you get a settlement amount less than the cost of a new TV. To buy a new TV you’ll have to come up with the difference out of pocket. Not as good of a deal for you. Clearly, insuring your personal property on a replacement cost basis is a better advantage than actual cash value. Sometimes it costs a bit more, but not always. We can help you understand how how your policy works and can check the price both ways, to help you make the right decision. Your liability coverage pays if someone sues you for their injuries due to a covered claim. When we think of such accidents we most commonly think of injuries that occur on your property – someone slips and falls, a dog bite, etc. However, the liability protection under your home policy extends beyond your property to your everyday life. Liability Insurance helps protect you against the financial burden arising from injury (or property damage) that you or your family may cause to other people. It typically even covers injuries whether they happen on or away from your property. Liability insurance is all about protecting your assets from someone who sues you. So, you should have at least as much liability insurance as your financial worth. However, more than that may be prudent, and you should discuss your needs and risks thoroughly with a licensed agent at Alternatives Insurance® of Chesterfield. Your current liability limit will be stated on your Declarations page. This coverage pays medical bills for a guest who is injured on your property or in another covered claim. The idea is to do the right thing for someone – pay their medical bills – and then hope they don’t sue you. This protection is inexpensive, but could save you major hassles by preventing a lawsuit. Loss of use coverage provides monies for alternative living if your home is badly damaged and are you not able to live in it while it’s being fixed or replaced. That means you may have to pay rent somewhere or staying in a hotel while you’re also paying your mortgage. The Loss of Use coverage on your home policy pays those additional expenses for you. Your Declarations page may state a dollar limit for this coverage, or it may state a time limit. If there is a dollar limit, this is the most the insurance company will pay for these expenses. If there’s a time limit, your insurance will pay all covered expenses regardless of the amount but only for the specified period. Imagine your home is damaged by a tree crashing through your roof . You call your insurance agent to report the claim, and then you hear the worst news possible, “I’m sorry that’s not covered by your policy.” Now, you have a real problem. The unfortunate truth is no insurance policy covers you for everything that could possibly happen to you or your property. However, with a little bit of understanding, you can make sure you have the protection you need, and you can rest easy knowing your claims get paid by the insurance company. Just because you have an insurance policy, it does not mean everything and everyone in your home is covered. Your home insurance policy does not cover you against every “cause of loss”. Examples of “cause of loss” include fire, high wind, and other “perils”. A standard home policy excludes many causes of loss. That is, it does NOT protect you from certain perils – like earthquake, flood, termite damage and many more. That means if your home is damaged by one of these excluded perils your policy will not pay and you have no insurance against them. You can purchase additional coverage to protect you from perils like earthquakes and floods. However, some excluded perils are not insurable, such as insect damage. Be sure to discuss your policy exclusions with an agent in our office and we’ll help you determine the best protection you need. Don’t be caught by surprise after the damage is done. As if your home policy wasn’t complicated enough already! There are also “special limits” of protection for some of your personal property. A “special limit” reduces the protection specifically available for certain types of property. Property subject to a special limit typically includes property used for business, cash & coin collections, jewelry & furs, guns, silverware, valuable art and more. Additionally, some of these special limits apply only if the property is lost or stolen – making things just a little more confusing. For example, the standard home policy typically includes $1,000 of protection for stolen jewelry. If your $2,500 diamond engagement ring is stolen, you will receive $1,000 from the insurance company. Ouch! And, if the stone falls out of the ring and is lost, there may be NO coverage at all! It is very important you fully discuss these conditions and special limits with our agents and buy the protection you need. Otherwise, you could find yourself with a very nasty surprise … an unpaid claim! The standard home policy have exclusions for many reasons. But then the insurance company gives you an opportunity to buy some of them back. So, you have the option of increasing protection where you personally need it. Identity Theft – many home insurers now offer protection for Identity Theft in their home policies. This will help pay the expenses you incur to restore your identity if it’s stolen. Water & Sewage Backup – the standard home policy excludes damage caused by a water or sewage system backup. You can buy this protection if you want it. Ordinance & Law – pays the increased costs of repairing or rebuilding your home that are required to be build in accordance to current building codes. Packaged Endorsements – often times an insurance company will package the optional coverages people most commonly buy into a single endorsement for a lower price. There are many more optional coverage and exclusion buy-backs our agents can explain to you. Its worth the time to spend with your Alternatives Insurance® of Chesterfield agent to understand the coverages available and make good decisions about your protection. Alternatives Insurance® of Chesterfield has access to many insurance carriers and thousands of different products to choose from. These insurance carriers allow us to tailor an insurance policy specifically to your needs and help cover your risks. If you have you been searching the internet for a “ Home Insurance Agent Chesterfield MO ”, your search is over! The agents of Alternatives Insurance® of Chesterfield provide homeowners insurance and services by the top rated insurance carriers in the country. We have the products to protect your home in cases of fire, theft, storms and more. Whether you’re just starting out renting or buying a home, or you’ve built the home of your dreams, Alternatives Insurance® of Chesterfield offers home insurance options that are right for you. We are your Home Insurance Agent of Chesterfield MO and can help you choose the best coverages to meet your needs. From standard coverage options that provide basic protection for your home and property, all the way up to deluxe options that better protect your home’s value and assets like jewelry. You can even get coverage that protects you in the event of law suits or identity theft. We also insure condos. An Alternatives Insurance® Home Insurance Agent Chesterfield MO will get you the coverage you want with the savings you need. Our professional agents have access to a variety of insurance carriers that offer Homeowners Insurance, Renters Insurance, Landlord Insurance, Condo Insurance, Mobile Home Insurance, Catastrophe Insurance and more. Since moving into your house, you’ve probably purchased a number of valuable items. At the very least, your house probably isn’t empty. Thankfully, your homeowners insurance covers some portion of your possessions after a loss, such as a fire or burglary. But how much does it cover, and is it enough to replace your most treasured assets? How much have you thought about your insurance protection? If you have not taken a recent inventory and assessed the replacement value of your daily use items, it’s time for a review. Alternatives Insurance® of Chesterfield agents have the tools and resources for you to take a proper inventory and make sure all the items are included. Your basic homeowners insurance policy may not cover the replacement value of these items if they are destroyed or stolen. In this case, you may need to purchase a rider on your homeowners policy to cover these special items. Your local Home Insurance Agent Chesterfield MO can help to go over these items and the contents insurance needed to cover them. Our “ Home Insurance Agent Chesterfield MO ” team is committed to professionalism. Our dedication to superior client service comes from a culture of professionalism and respect. All of our associates at Alternatives Insurance® of Chesterfield have strong credentials and all of our policies are presented to you in a consistent and professional manner. Your search for “ Home Insurance Agent Chesterfield MO ” is over. Welcome to Alternatives Insurance® of Chesterfield. If you have you been searching the internet for a ” Home Insurance Quote Chesterfield MO ,” your search is over! The agents of Alternatives Insurance® of Chesterfield provide homeowners insurance and services by the top rated insurance carriers in the country. Our Personal Insurance offerings also include insurance products and risk valuation services. Our agents serve as your full service insurance providers for auto, home, boat, RV, motorcycle, and power sports to include life and annuities. We have you covered throughout all aspects of your life to protect what matters most. Because we offer a full line of insurance services, we can save you money with multi-policy discounts. You will not get that benefit when you purchase your insurance coverages through multiple agencies. Getting a Home Insurance Quote Chesterfield MO is simple. Call one of our helpful staff members or agents. Have your home address, mortgage value and a good idea of the value of your personal belongings. Alternatives Insurance® of Chesterfield will also provide you with a home inventory checklist, so that you may take a complete inventory of your personal belongings and make certain all your valuables are covered in your home insurance policy. There are six levels of protection for your home. Here is a list of the items you’ll find in your policy. Complete details can be found on our homeowners page. Dwelling. This is your home and attached structures, such as a garage. Other Structures. These include structures not attached to the home, such as a storage shed. Personal Property. This includes furniture, clothing, electronics, appliances, jewelry, etc. Loss of Use. This coverage is important if you have damage to your home and you cannot live in it while it is being repaired. Liability Coverage. This coverage pays if someone sues you for their injuries, on or off your property. Medical. This coverage pays if a guest is injured on your property. Be Careful: Home Insurance Quote Chesterfield MO can vary greatly! Homeowners Insurance policies in Missouri can be very different and have very different cost. With hundreds of home insurance carriers and many different protection options, it is best to ask your agent for help making the decisions to be certain your personal belongings are protected. Alternatives Insurance® of Chesterfield agents have your interest in mind. The best homeowners insurance purchase decision is often made with the help of a professional insurance agent – and we are available Monday through Saturday. Alternatives Insurance® of Chesterfield has the Best Value and Customer Service agents with a combined high level expertise and relationships with top-rated companies and products that provide exceptional value to our clients. Our trained, professional staff will do the research, analysis, and shopping for you. You save time and money and get the best Chesterfield Missouri Home Insurance protection. So, if you have you been searching the internet for a “ Home Insurance Quote Chesterfield MO ”, your search is over! Call Alternatives Insurance® of Chesterfield (636) 449-1213. Home Insurance TIP. Alternatives Insurance® of Chesterfield Missouri will be providing useful insurance news and tips that will save you money and possibly prevent some bad claims. If you have a washing machine, please check the connecting water hoses. They should be the new flexible steel hoses — if you still have rubber hoses — you are likely to have a very bad water damage problem at some point. If you do have rubber hoses, please turn the water off to the washing machine when you leave for a few days–like on vacation. Water running out of your front door when you return home is not a fun experience. More Insurance Tips about preventing claims and saving money coming soon! Alternatives Insurance® of Chesterfield Missouri (636) 449-1213. We provide insurance and financial services to all residence of Missouri. Even if you live outside “Tornado Alley,” the area of the country that runs north from Texas through eastern Nebraska and northeast to Indiana, you are still vulnerable to tornadoes. Kansas, Oklahoma and Texas may see more of these unpredictable and dangerous storms than other states, but the rest of the country also gets its share of twisters. Follow these steps to protect your family and your home from disaster. Structures built to meet or exceed current model building codes for high-wind regions have a much better chance of surviving violent windstorms. The Standard Building Code, issued by the Southern Building Code Congress International, Inc., is one source for guidance on fortifying your home against fierce winds. Although no home can withstand a direct hit from a severe tornado, solid construction will help your home survive if it’s to the side of the tornado’s path. When inspecting your home, pay particular attention to the windows, doors, roof, gables and connections (roof-to-wall, wall-to-foundation). Residences in inland areas are typically not built to withstand high wind forces, and weaknesses in these elements of your home make it more vulnerable to significant damage. If you’re handy with a hammer and saw, you can do much of the work yourself. Work involving your home’s structure may require a building contractor, however, or even a registered design professional such as an architect or engineer. Replace gravel/rock landscaping material with shredded bark. Keep trees and shrubbery trimmed. Cut weak branches and trees that could fall on your house. Windows: If you are replacing your existing windows, install impact-resistant window systems, which have a much better chance of surviving a major windstorm. These window systems are commonly available in hurricane-prone areas. If you are unable to find them locally, you can order them from manufacturers or home improvement stores in coastal areas. Entry doors: Make certain your doors have at least three hinges and a dead-bolt security lock, with a bolt at least one inch long. Anchor door frames securely to wall framing. Patio doors: Sliding glass doors are more vulnerable to wind damage than most other doors. If you are replacing your patio doors or building a new home, consider installing impact-resistant door systems made of laminated glass, plastic glazing or a combination of plastic and glass. Garage doors: Because of their size and construction, garage doors are highly susceptible to wind damage. A qualified inspector can determine if both the door and the track system can resist high winds and, if necessary, replace them with a stronger system. Garage doors more than 8 feet wide are most vulnerable. Install permanent wood or metal stiffeners. Or contact the door manufacturer’s technical staff for recommendations about temporary center supports you can attach and remove easily when severe weather threatens. Remove old coverings down to the bare wood sheathing. Remove sheathing to confirm that rafters and trusses are securely connected to the walls. Refasten existing sheathing according to the proper fastening schedule outlined in the current model building code for high-wind regions. Install a roof covering designed to resist high winds. Seal all roof sheathing joints with self-stick rubberized asphalt tape to provide a secondary moisture barrier. If you want to give your roof sheathing added protection, but it’s not time to re-roof, glue the sheathing to the rafters and the trusses. Use an adhesive that conforms to Performance Specification AFG-01 developed by APA — The Engineered Wood Association, which you can find at any hardware store or home improvement center. Gables: Brace the end wall of a gable roof properly to resist high winds. Check the current model building code for high-wind regions for appropriate guidance, or consult a qualified engineer or architect. Connections: The points where the roof and the foundation meet the walls of your house are extremely important if your home is to resist high winds and the pressures they place on the entire structure. Anchor the roof to the walls with metal clips and straps (most easily added when you replace your roof). Make certain the walls are properly anchored to the foundation. A registered design professional can determine if these joints need retrofitting, and a qualified contractor can perform the work the design professional identifies. If your house has more than one story, make certain the upper story wall framing is firmly connected to the lower framing. The best time to do this is when you remodel. Decide in advance where you will take shelter (a local community shelter, perhaps, or your own underground storm cellar or in-residence “safe” room). When a tornado approaches, go there immediately. If your home has no storm cellar or in-residence “safe” room and you have no time to get to a community shelter, head to the centermost part of your basement or home — away from windows and preferably under something sturdy like a workbench or staircase. The more walls between you and the outside, the better. Become familiar with your community’s severe weather warning system and make certain every adult and teenager in your family knows what to do when a tornado watch or warning sounds. Learn about your workplace’s disaster safety plans and similar measures at your children’s schools or day care centers. Study your community’s disaster preparedness plans and create a family plan in case you are able to move to a community shelter. Identify escape routes from your home and neighborhood and designate an emergency meeting place for your family to reunite if you become separated. Also establish a contact point to communicate with concerned relatives. Put together an emergency kit that includes a three-day supply of drinking water and food you don’t have to refrigerate or cook; first aid supplies; a portable NOAA weather radio; a wrench and other basic tools; a flashlight; work gloves; emergency cooking equipment; portable lanterns; fresh batteries for each piece of equipment; clothing; blankets; baby items; prescription medications; extra car and house keys; extra eyeglasses; credit cards and cash; important documents, including insurance policies. Move anything in your yard that can become flying debris inside your house or garage before a storm strikes. Do this only if authorities have announced a tornado watch, however. If authorities have announced a tornado warning, leave it all alone. Don’t open your windows. You won’t save the house, as once thought, and you may actually make things worse by giving wind and rain a chance to get inside. Don’t try to ride out a tornado in a manufactured home. Even manufactured homes with tie-downs overturn in these storms because they have light frames and offer winds a large surface area to push against. In addition, their exteriors are vulnerable to high winds and wind-borne debris. Finally, review your homeowners insurance policy periodically with your insurance agent or company representative to make sure you have sufficient coverage to rebuild your life and home after a tornado. Report any property damage to your insurance agent or company representative immediately after a natural disaster and make temporary repairs to prevent further damage. For information about filing an insurance claim after a natural disaster, contact your insurance agent or insurance company. Source: Institute for Business and Home Safety. IBHS is a national nonprofit initiative of the insurance industry to reduce deaths, injuries, property damage, economic losses and human suffering caused by natural disasters. Meet the First Response Team: First on the scene providing relief. When a deadly tornado hits, moving into an interior room or closet of your home – as many guidelines recommend – might not offer enough protection. That’s why some homeowners choose to build or buy a family storm shelter. What kinds of storm shelters are there? Three main types of shelters are designed to help protect you from severe weather. While each is intended to keep you and your family safe, each has its pros and cons. Underground: A modern version of the old “storm cellars,” these shelters are usually safe from flying debris and high winds. If you have to go outdoors (however briefly) to get inside, it can be difficult to access them if conditions outside are hazardous. Installation can be a problem, depending on the type of rock and the water table in your area. In-residence: These act more like fortified closets, so they are more accessible when a tornado is imminent. They are usually built into a new house using reinforced concrete, reinforced masonry or wood/steel combinations. Building one into an existing house can be difficult and costly. Alternatives include pre-built metal shelters that are not only easier to install, but can be placed almost anywhere in the house. Community: If a family shelter isn’t an option, community shelters can hold multiple families (from as few as a dozen people to several hundred). Commonly used in manufactured housing areas, these shelters are usually above ground – which exposes them to flying debris – but many more lives can be saved. What’s the best storm shelter? There’s no one authority to tell you what the best storm shelter is, nor can the federal government endorse a specific type of storm shelter as being “the best.” However, safety standards for storm shelters and shelter components have been established by the Federal Emergency Management Agency to ensure that you will be protected in most tornadoes, while the National Storm Shelter Association has also established a shelter standard. The Wind Science and Engineering Research Center at Texas Tech University performs tests on shelters and various shelter components to see if they meet both sets of guidelines. Researchers use high-powered air cannon to shoot wooden two-by-fours at shelter walls and doors to simulate flying debris, while another test uses a wind tunnel to simulate the high winds and stress that walls would encounter. These tests and guidelines can help you choose the shelter that can best protect your family when a real tornado hits. The following rules are only a few of the federal guidelines established by FEMA. More information, including building plans, materials and more is available either by calling 1-888-565-3896 and requesting publication FEMA 320 (“Taking Shelter from the Storm: Building a Safe Room Inside Your House”). High winds: Tested with a 3-second gust of 250 mph. Walls, doors and ceilings must be able to withstand the peak wind velocity without buckling or separating. The shelter cannot overturn or slide. The walls and ceiling of a shelter must resist penetration by a test object. Shelters must have a protected ventilation system. Shelters should have at least one fire extinguisher, flashlights, a first-aid kit, 8 hours’ supply of drinking water, and a NOAA weather radio. Shelters must be watertight and resist flotation due to saturated soil. Shelters must contain a transmitter of some sort to signal the location of the shelter to emergency personnel, should debris trap shelter occupants. Source: National Weather Service, Huntsville, Ala.
First on the scene providing relief. Here in the USA, tornadoes have occurred in every month, so any time is a good time to review tornado safety procedures – for home, for school, for work, in the car, and while out and about. And if you are considering a storm shelter, take a look at our page about shelters. Each year about a thousand tornadoes touch down in the US. Only a small percentage actually strike occupied buildings, but every year a number of people are killed or injured. The chances that a tornado will strike a building that you are in are very small, however, and you can greatly reduce the chance of injury by doing a few simple things. One of the most important things you can do to prevent being injured in a tornado is to be ALERT to the onset of severe weather. Most deaths and injuries happen to people who are unaware and uninformed. Young children or the mentally challenged may not recognize a dangerous situation. The ill, elderly, or invalid may not be able to reach shelter in time. Those who ignore the weather because of indifference or overconfidence may not perceive the danger. Stay aware, and you will stay alive! If you don’t regularly watch or listen to the weather report, but strange clouds start moving in and the weather begins to look stormy, turn to the local radio or television station to get the weather forecast. Check The Weather Channel for additional information, or if you have trouble getting up-to-the-minute forecasts on a regular radio, then a “NOAA weather radio” is a wise investment. If a tornado “warning” is issued, it means that a tornado has actually been spotted, or is strongly indicated on radar, and it is time to go to a safe shelter immediately. A sickly greenish or greenish black color to the sky. If there is a watch or warning posted, then the fall of hail should be considered as a real danger sign. Hail can be common in some areas, however, and usually has no tornadic activity along with it. A strange quiet that occurs within or shortly after the thunderstorm. Clouds moving by very fast, especially in a rotating pattern or converging toward one area of the sky. A sound a little like a waterfall or rushing air at first, but turning into a roar as it comes closer. The sound of a tornado has been likened to that of both railroad trains and jets. Debris dropping from the sky. 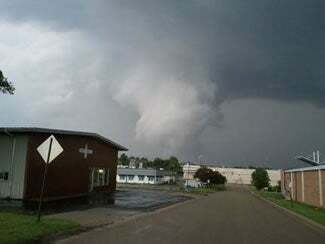 An obvious “funnel-shaped” cloud that is rotating, or debris such as branches or leaves being pulled upwards, even if no funnel cloud is visible. If you see a tornado and it is not moving to the right or to the left relative to trees or power poles in the distance, it may be moving towards you! Remember that although tornadoes usually move from southwest to northeast, they also move towards the east, the southeast, the north, and even northwest. Encourage your family members to plan for their own safety in many different locations. It is important to make decisions about the safest places well BEFORE you ever have to go to them. Is it likely that a tornado will strike your home or school? No. But being ready for the possibility will keep you safer! Deaths and injuries from tornadoes have dropped dramatically in the past 50 years. Casualties numbers are holding steady as scientists learn more about tornadoes and develop the technologies that detect them sooner. Forecasters must continue to improve techniques because the population is increasing. The National Weather Service, Storm Prediction Center, and television and radio weather people have taken full advantage of the advancements in tornado prediction to improve warnings. 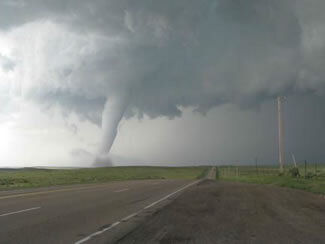 In addition, many people generously donate their time and expertise to help protect their neighbors and communities in another way — by tornado and severe storm “spotting.” “Spotters” combine an interest in the weather, a willingness to serve and often, ham radio experience to make tornado prone areas safer for all. Spotting can provide a focus to a person’s interest in the weather, and ham radio helps you meet other like-minded people. It is not often that something that starts out as a hobby can potentially do so much good. If you are interested in Skywarn training and becoming a spotter, check out the National Skywarn page. Anything less than 16 feet long is usually called “personal watercraft” by most insurers. This includes Jet Skis and Waverunners. “Boats” are 16 feet to 25 feet, 11 inches. The Missouri watercraft insurance that you will need depends on the size and type of watercraft and how it is used. For example, if you use your watercraft for water-skiing, make sure you get coverage for this exposure as well. (Depending on the insurance company, it may not be automatically covered.) Generally, your Missouri Boat Insurance policy should include coverage for injuries to you and your passengers, the craft itself, property and bodily injury liability (for damage and injuries to other crafts and people) and theft. You can also get coverage for the trailer(s) you use to transport the watercraft. The Missouri Boater Safety Handbook is an excellent resource to learn more about Boating in Missouri. Insurance companies generally define a “boat” as 16 to 25′ 11″ powerboats and sailboats. Standard policies for boats cover damage to the craft, including damage caused by fire, lightning, theft, vandalism, collisions, and windstorms. The coverage is usually for the boat itself, outboard motor(s), the boat’s trailer and personal property on the craft that is part of the normal operation of the vessel. Many insurers offer separate coverage for other personal property such as fishing or diving equipment. Depending on the insurance company and the age of your boat, you may find a variety of claim settlement options in the event that your boat experiences a total loss. The best coverage, usually available only on recently manufactured or newer watercraft, is “replacement cost” where the company will “replace” your loss with the same or similar new boat. Other options include “agreed value” where you and the insurance company agree in advance what the settlement value will be in a total loss, and “actual cash value or ACV” where the insurance company will pay the fair market value of the boat at the time of the loss up to a specified rating base.e craft that is part of the normal operation of the vessel. The standard Missouri boat insurance policy also provides liability coverage, which is usually offered in increments of $100,000 to as much as $1 million. Many also offer an boat umbrella liability insurance policy that will increase the liability limits into the millions. Most boat policies also cover medical expenses incurred by you, your family and any other passengers on board. If your watercraft is 26 feet or longer, you may need to buy yacht insurance, which provides basically the same coverage as Missouri boat insurance, but the policy terms are different. Under a boat policy, coverage for damage to the craft is called “physical damage.” Under a yacht policy, the boat is referred to as ”hull.” Liability coverage under a yacht policy carries the name “property and indemnity,” which insurance companies abbreviate as P&I. As with boat liability coverage, P&I is available in increments of $100,000. Depending on the size of your craft, you can buy P&I limits from $300,000 to as much as $50 million. Although some terms are different and the coverage limits may be different, Yacht insurance coverage is basically the same as for a Boat. There may be some differences depending on how and where used, etc…. Our Missouri boat insurance specialist can help you with the options to cover your risks properly. The cost of your boat or yacht policy is based on a variety of factors: horsepower; how fast it moves (it can cost as much as 50% more to insure a speedboat than it does a sailboat of similar size); where it is to be used; age of the craft and experience of the vessel’s operator. Missouri Boat Insurance Savings Tip: Insurers often offer discounts of 5% to 20% to those boat/yacht owners who have taken an approved boating safety course. Discounts are usually available from some insurers for newer vessels and protective devices (depth finders, ship-to-shore radios, burglar alarms). You can also save money on the policy by electing a higher deductible. Boating is not a cheap hobby or sport and carries with it many potential risks which is the main reason why Missouri watercraft insurance is not cheap. Therefore, it really is important to assess your risks, define the coverages you need, and to find the companies that offer the best value for the protection you need. This task not easy and generally requires the assistance from an insurance professional who has experience and knowledge of watercraft insurance. There are a lot of different policies and coverage options available. Some policies might be significantly cheaper than others, but they may not offer the insurance coverages you need to cover your risks. Missouri Boat Insurance Shopping Tip: Watercraft Insurance is a complex with many options. Let our experience watercraft insurance specialist help you to assess your risks, define the coverages you need, and shop the Missouri Boat Insurance companies to find the best protection and value for you. We recommend the Missouri Boater Safety Handbook to learn more about boating in Missouri. Why Choose Alternatives Insurance® of Chesterfield? We start by offering the best insurance products at a reasonable price. But it’s the Alternatives Insurance® of Chesterfield team that really set us apart from the competition. With combined experience of 60 years, our sales and support staff members can handle your transactions quickly and efficiently. We service each and every account using out team of insurance professionals and we’re always available to answer your questions. Our dedication to client service comes from a culture of professionalism and respect. All of our associates at Alternatives Insurance® of Chesterfield have strong credentials and all of our policies are presented to you in a consistent and professional manner. Alternatives Insurance® of Chesterfield has unique industry relationships, allowing us to provide exclusive insurance solutions to our customers. Additionally, every staff member is trained to actively listen and provide helpful answers presented in a way in which our policy holders clearly understand. We believe trust is something earned by listening to our customers while providing helpful advice and support. Trust and consistent underwriting practices is what we expect from our carrier partners, and in return we owe the same level of service to you.